We decided to take advantage of a "no camping" weekend and give Bullwinkle his first bath. After a couple of months on the road and several nights by the sea and in dusty campgrounds, this moose was overdue. We had no clue how you give a moose a bath. We did our research and loaded up our supplies: a couple of buckets, microfiber towels and baby shampoo. (Really, baby shampoo!) 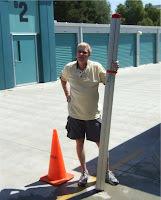 Our storage facility has a handy wash area. For $25 we had four hours of access to a space to work, a long hose and water. With that, we went to work on our 1,325 square-foot task. We divided the work fairly equally. P took care of everything above six feet or so. M washed and dried everything below. 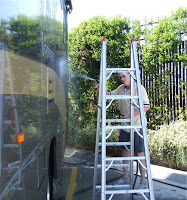 Here's P rinsing away with his feet firmly on the ground, behind our nifty new ladder that helped him reach the highest heights with ease. 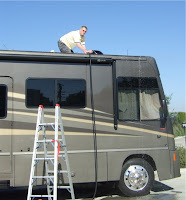 Here's what makes this ladder nifty. It folds up to the size of a two-by-four and stores nicely in our pass-through bay in the "basement". About three hours later we were done. And, Bullwinkle was once again sparkling in the sun. The front was the worst. Hundreds of bugs have met their maker on this grungy surface. Now it's ready for that first "splat", which will probably happen three minutes into our next trip. The sides were bug-free, but covered in road grime. 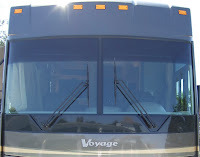 Now it's clean as a whistle, and ready for our next voyage. We're not sure you can tell a difference in these pictures. But, we sure can. We're both moaning and groaning with stiff muscles after all this work. Though, the sense of accomplishment after cleaning a beast like this is really something! Meanwhile, Bullwinkle will sit gathering dust for awhile. It'll be next month before we hit the road again. 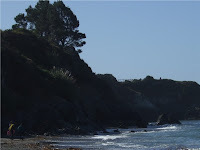 The Northern California coast is absolutely stunning. No doubt about it. And, we soaked up as much as we could over Labor Day weekend at Ft. Bragg. 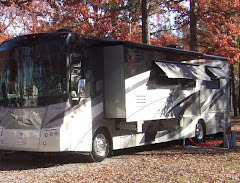 The drive to and from Ft. Bragg is not for the faint of heart, especially in a motorhome. On the way up, we turned off Highway 101 at Cloverdale, and did a 50-something-mile gig of hairpin turns with very narrow shoulders. There was a flat part or two, but it all seemed pretty darn curvy. 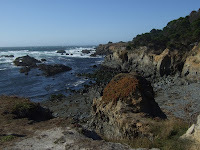 With the 50 curvy miles behind us, we faced a 15-mile drive north on equally curvy Highway 1 to Ft. Bragg. Sure, there was an amazing ocean coast to our left, but I don't think either one of us actually saw it. After a very relaxing four-night weekend, we took an alternate route back. From Ft. Bragg, we went just a couple of miles north of our campgrounds on a very straight patch of Highway 1 to the intersection of Highway 20. Highway 20 is a 33-mile stretch of curvy roads that are slightly wider and might, in a few spots, actually have a shoulder. 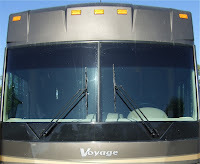 The road is shared with cars, trucks, other RVs and high-speed logging trucks. Yes, it's an adventure! Where Highway 20 intersects with Highway 101 we headed south and experienced slow single lane traffic, road construction, hills, curves, the bumpiest roads known to mankind and traffic. Lots of fun. Round these parts, when people head to Ft. Bragg, a great debate remains: Do you take Highway 128 out of Cloverdale or Highway 20 out of Willits? We say it's six of one, half-dozen of the other. Let the great debate continue! Our Labor Day weekend camping in Fort Bragg actually spanned both sides of Highway 1. 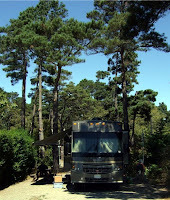 We spent three nights with our friends in a group site (which we think is actually the play area) at Woodside RV Park and Campground on the west side of Highway 1, just south of Ft. Bragg. From here, a look at the beach was just a bike ride and short stroll away. And, we were able to assemble our rigs in close proximity to each other and a campfire that kept us sharing stories and food and staying warm all weekend. Honestly, other than that great impromptu group site, this campground was basically a dump. If you know Mendocino County, you'll understand. About three-quarters of the place was filled with "permanent" residents in "rigs" of various states of disrepair. Basically, there were a half dozen or so pull-throughs with Labor Day weekend campers and us in the play area. The rest of the folks lived there. The place where we keep Bullwinkle is closed on major holidays, including Labor Day. So, our plans were to head home on Tuesday. With the rest of our group heading out on Labor Day, we made other plans. On Sunday, we had peddled across Highway 1 to Pomo RV Park and Campground. We liked what we saw. While it didn't offer the ambience of camping with our abalone diving friends, it did offer spacious full hookup sites with lots of privacy...and no permanent residents. It was nice. And, they had plenty of space for Monday night. As Monday morning turned to afternoon, our friends headed out. With best wishes for safe travels and treasured memories of a fun weekend with friends, we packed up and got ready to move. With our shortest ever commute from one campground to another (about 1/4 mile), we crossed Highway 1 into the pristine comfort of Pomo. The woman at registration graciously allowed us to check in early at Site #5, which featured a level pad, full hookups, tons of shade and an expansive view of a grassy meadow. Two campgrounds that were decidedly different. One dumpy place offered a delightful place to hang out with friends for a few days. Great fun! Another offered a cozy place for us to spend a night alone with all the camping comforts we enjoy. 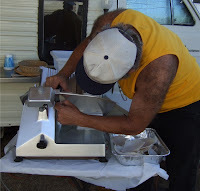 Our camping weekend at Ft. Bragg was really all about abalone. 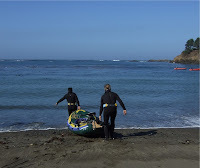 The group of friends we joined are avid abalone divers. They make a couple of dives every season: Memorial Day and Labor Day. 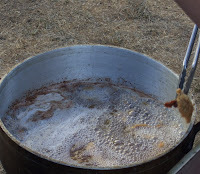 For us, this camping adventure was a culinary first. We were abalone newbies! We weren't sure how, or if, we'd like it. But, we were definitely up for the adventure of it all. 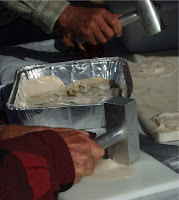 If thin slicing is the first step to making abalone edible, pounding is definitely the second. 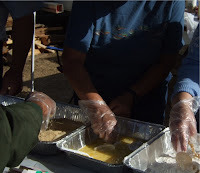 With mallets hand-crafted by camper John, the group set about the task of pounding these thin little abalone discs into something that looks like a dishrag, and is one step closer to being a delicacy. Finally, each sliced, pounded and breaded piece took a bath in hot oil. At last, they were ready. With shared sides and lots of tasty beer and wine, these yummy delicacies were enjoyed by all. And what did the newbies think? Basically, we like just about anything that's breaded and deep fried. (Who doesn't?) And, abalone is no exception. Especially when enjoyed in the great outdoors in the company of friends, this is mighty tasty stuff.